Windy demonstrates exceptional presence and poise, and at 2 years of age is exceptionally well-developed. 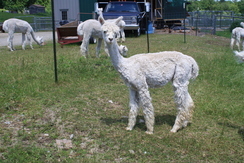 This well built young male has great Accoyo genetics, marvelous temperament and the most fabulous fleece. Put him to work improving your herd; you won't regret it! Martina has been a wonderful foundation and production dam for us since our beginning in 2001. She may have reached the age where production is slowing or stopped, since I haven't been able to get and keep her pregnant for the past year. 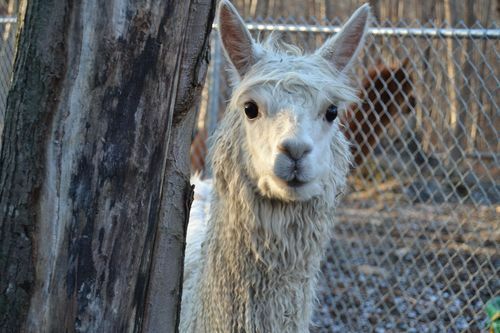 If you're looking for a mellow older gal to serve as a companion to another female, or as "auntie" to your herd's crias, Martina may be the gal for you. If you can get her pregnant again, that's wonderful. She may have more production in her, I just don't have the time, space and patience to keep trying since I have several of her daughters in production now. Martina throws wonderful crias, including her 5-time blue-ribbon winning son, LSF Sarabande. Mandy delivered a very nice beige female cria sired by our MoJo this year. Her daughter has MoJo's exquisite conformation and presence, and is a very pleasing addition to our herd. Mandy was reared to MoJo, and confirmed pregnant by sonogram on March 11, 2019.